Eco conscious furniture designer Benjamin Rollins Caldwell has now become more than a frequent figure here on EcoArrivals. While last week we told you about Capped Out Chair created from recycled soda bottle caps, this time he has come up with a low table that utilizes bolts, wing nuts and scrap wood salvaged from discarded pianos. 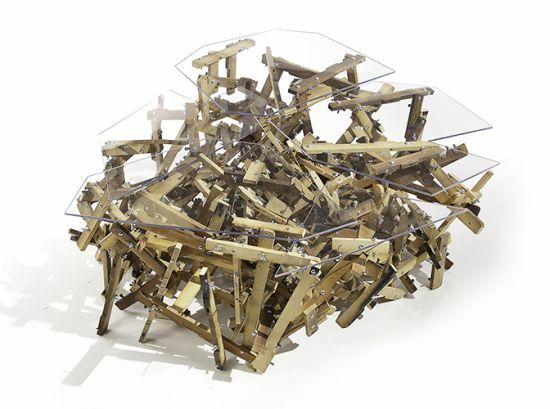 Dubbed as Wingin’ It Low Table, the unique furniture item flaunts a plexiglass surface, which is attached to scrap wood planks using bolts and wing nuts. Aside from allowing its owner to entertain guests, the artistic-looking low table will prove to be a perpetual source of envy for others. Anyhow, before you could actually do that, we hope that folks at BRC Designs introduce its production version anytime soon.